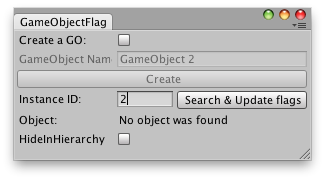 Creates a game object with HideFlags and specified components. This is very similar to creating a GameObject the usual way, except it sets the specified HideFlags immediately. Editor Window that shows how does the example looks.